These Ellis Hydrangea Tiers have a medium scale Hydrangea floral of blues and greens. These Ellis Hydrangea Panels have a medium scale Hydrangea floral of blues and greens. 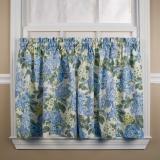 This Ellis Hydrangea Shower Curtain has a medium scale Hydrangea floral of blues and greens. These Ellis Logan Check Tiers have a 1/8" small gingham check on 100% cotton 7 ounce duck cloth. 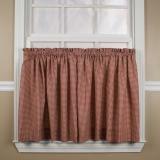 These Ellis Logan Check Panels have a 1/8" small gingham check on 100% cotton 7 ounce duck cloth. 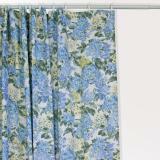 This Ellis Logan Check Shower Curtain has a 1/8" small gingham check on 100% cotton 7 ounce duck cloth. These Ellis Victoria Park Tiers have an all over toile print on an off-white background. 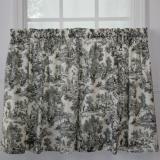 These Ellis Victoria Park Panels have an all over toile print on an off-white background. English Ivy has ivy leaves and vines fountain thru a traditional and intricate detailed lace. 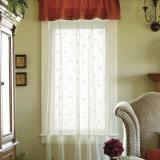 Annamaria is a faux Linen Macrame.